During the fourth century BCE, a distinctive style of terracotta figures emerged in the rural Boeotian town of Tanagra. Rather than emphasizing subjects from mythology, these sculptural works often depict real people, especially women in everyday clothing such as the figure on display. 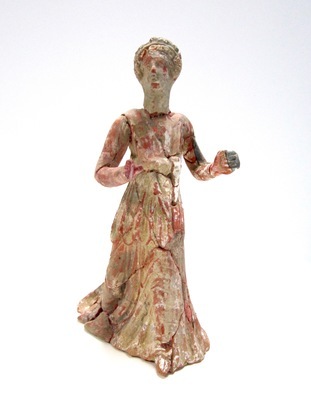 Reassembled from shards with traces of polychrome remaining, the figure wears a long flowing chiton (an ancient Greek garment secured by a belt at the waist and brooches at the shoulders) and a himation over it in the manner of a cloak. Characteristic of Hellenistic art, she is seen in action.